The purpose of this position is to work within the Rama Police Service on the development and delivery of an Impaired Vision – Community Prevention and Education program focused on preventative measures. The successful candidate will represent the Rama Police Service through collaborative efforts with other community-wide stakeholder groups that compliment a focus on education and preventative measures. This position may be required to work shift work and weekends. · Ability to work independently and as a team member. · Not have a criminal record for which a pardon has not been granted or absolute/conditional discharge that has not been sealed. · To enhance the community safety and well-being of the Chippewas of Rama First Nation community and surrounding area through a multi-sector partnership. · To implement an innovative, evidence-based, interactive learning model designed to educate the public about impaired and distracted driving, identified as Simulated Impaired Driving Experience (SIDNE) education model. · To leverage existing resources to build on the capacity of Rama Police Services and their partner agencies to offer public education over the effects of operating a motor vehicle while under the influence of mind altering substances such as alcohol, prescription and illicit drugs. · The duties and responsibilities outlined above are representative, but not all-inclusive. Only those applicants deemed qualified will be contacted for an interview. Rama Police is looking for a new Chief of Police. Objective of YIPI: To provide a safe and positive summer employment opportunity for youth that is reflective of the cultural diversity of the community. Resumes will be received until May 25th, 2018 at 5:00 p.m. The Youth in Policing Initiative (YIPI) provides an innovative summer employment opportunity for an area youth. This program will provide a mentorship for a youth to help build a strong healthy relationship with the Police and provide solid life skills necessary to excel in school and in the community. The Rama Police Service endeavours to provide a safe and productive summer employment opportunity. Applicants must be at least 15 years to 18 years of age, presently scheduled to attend Secondary School or Post Secondary School/Learning Centre and returning in September 2017. Resumes will be received until June 2, 2017 at 5:00 p.m.
Rama, ON (Thursday, November 10, 2016) - Casino Rama Resort became aware that it has been the victim of a cyberattack that resulted in the theft of (past and present) customer, employee and vendor information by an anonymous threat agent. Casino Rama Resort is working with the Ontario Provincial Police (OPP), the Royal Canadian Mounted Police (RCMP), the Ontario Lottery and Gaming Corporation (OLG) and the Alcohol and Gaming Commission of Ontario (AGCO), and has alerted the Office of the Privacy Commissioner of Canada (OPC) and the Information and Privacy Commissioner of Ontario (IPC). "Data security is a top priority for Casino Rama Resort, and we take our responsibility to protect our customers', employees' and vendors’ personal information very seriously,” said John Drake, President and CEO, Casino Rama Resort. The hacker claims to have accessed information that includes Casino Rama Resort IT information, financial reports respecting the hotel and casino, security incident reports, Casino Rama Resort email, patron credit inquiries, collection and debt information, vendor information and contracts and employee information including performance reviews, payroll data, terminations, social insurance numbers and dates of birth. The hacker claims that employee information dates from 2004 to 2016, and some of the other categories of information taken date back to 2007. As a precaution, Casino Rama Resort is advising customers, employees and vendors to monitor and verify all bank accounts, credit card and other financial transaction statements and report any suspicious activity to the appropriate financial institution. General tips and resources for protecting against identity theft and fraud are available on the OPC website, at: https://www.priv.gc.ca/resource/topic-sujet/itf-vif/index_e.asp and the IPC website, at https://www.ipc.on.ca/wp-content/uploads/Resources/id-theft-e.pdf. There is no indication that the hacker continues to have access to the system. It is possible, however, that the hacker will publish information that was stolen. Casino Rama Resort’s internal teams have been working with cyber security experts to neutralize the issue and provide further safeguards to the system since becoming aware of the situation on November 4th, 2016. Information updates will be available on the Casino Rama Resort website (www.casinorama.com/datainquiry<http://www.casinorama.com/datainquiry>) for those who wish additional information. Tuesday, May 10, 2016 is Census Day. Between early May and late June 2016, approximately 35,000 Statistics Canada employees will be working in neighbourhoods and communities across the country to conduct the census. Residents in your community may contact their local police force to verify the validity of the activities being carried out by Crew Leaders and Enumerators. How will I know if they are legitimate Statistics Canada employees? Every Enumerator and Crew Leader will have an identification card that features the Statistics Canada identifier, along with his or her name, employment number and photo. Residents can contact the Census Help Line at 1-855-700-2016 if they wish to confirm the identity of the Enumerator or the Crew Leader at their door. Will I be required to provide personal information to Statistics Canada such as my Social Insurance Number, banking information, telephone number or email address? You do not need to provide your Social Insurance Number or banking information to complete the census questionnaire. However, you will be asked to provide a telephone number and an email address in case follow-up questions are required. Is there a screening process for Enumerators and Crew Leaders? In order to be considered for census positions, candidates must pass a written test, a reference check, and a government security assessment. How does Statistics Canada ensure the confidentiality and security of information collected during the census? Statistics Canada places the highest priority on protecting the confidentiality of individual census questionnaires. Answers collected under the authority of the Statistics Act are kept strictly confidential. All employees are sworn to secrecy when they are hired. The Statistics Act states that employees are liable for fines of up to $1,000, and/or jail terms of up to six months if they reveal personal information. Applicants must be at least 15 years to 18 years of age, presently scheduled to attend Secondary School or Post Secondary School/Learning Centre and returning in September 2015. Resumes will be received until May 29th, 2015 at 5:00 p.m.
Rama Police, Fire and EMS Services are gearing up to spread the message…. Like tying a string around your finger to remember to buy milk at the grocery store, the "Thumbs Up” thumb band is a reminder to keep your thumbs off your phone and your eyes on the road. Our YIPI (Youth in Policing Initiative) students created posters for the launch of the campaign and our officers are distributing thumb bands during traffic stops and R.I.D.E. programs, and cautioning drivers not to text and drive. There is solid research that indicates that distracted drivers are more likely to cause collisions and serious injury than impaired drivers. According to the Canadian Automobile Association, texting drivers are 23-times more likely to be involved in a collision. That is why all police services are increasing enforcement and education around this major causal factor for collisions, and why Rama’s emergency services are supporting "Thumbs Up”. Crime Prevention Week is an opportune time to highlight successful partnerships in areas where the police and community work together to develop a multi-sectoral approach to crime prevention and build a stronger and safer community. This year, Rama Police have teamed up with Rama EMS and Rama Fire Rescue Service to combat distracted driving, which has become one of Ontario’s "Big Four” in dangerous driving practices. We aim to change perceptions and behaviours so that drivers become more aware that the dangers of distracted driving apply to everyone. If we’ve encouraged even one driver to think twice about picking up that phone, we may have prevented an avoidable collision, or even saved a life. Thumb bands are available at the First Nation Administration Office, Rama Country Market, the Hub at the Mask or from the Rama Police detachment. The Rama Police Service has launched a new distracted driving campaign which aims to encourage drivers to avoid texting and other dangerous distractions while driving. The issue of distracted driving is now one of the top traffic safety issues for all Ontario police services and the current leading cause of fatal collisions in the province of Ontario. According to Canadian Automobile Association Statistics, you are 23 times more likely to be involved in a crash if you are texting. No one should lose their life or suffer serious injury because a driver was not devoting his or her full attention to the road. To encourage drivers to put an end to this dangerous behaviour, the Rama Police will be distributing "Thumbs Up” thumb bands which are meant to be worn as a reminder to avoid distractions while driving, particularly texting. Officers will be distributing the thumb bands during traffic stops, R.I.D.E. programs, and community events around the area. The bands are also available at the Rama Police detachment. The Rama Police Service is supporting the launch of Discover Policing, a Province-wide, collaborative initiative under the auspices of the Ontario Association of Chiefs of Police, which aims to attract young people to a career in policing. Facebook: The Discover Policing Facebook page will be the primary source of information for the initiative. This page will include information about Discover Policing, provide helpful resources and links for potential candidates, links to all police agencies, and a calendar of recruitment events for police services across Ontario. Twitter: This Twitter account, @DiscoverPolicin, will connect users to police personnel who can assist users with their queries. LinkedIn: Users of this professional networking platform will be able to connect with police personnel and learn more about policing in Ontario. The Rama Police Service is also pleased to announce that it will participate in the Discover Policing Exposition which will be held on October 15, 2014 at the Toronto Police College. This one-day event, which is free of charge for members of the public, will provide an opportunity for Ontario police services to showcase the profession of policing to potential candidates and for attendees to engage directly with police personnel. It will take place from 12:00 pm to 8:00 pm and feature exhibitor booths for police agencies, presentations by police personnel about career opportunities, and special demonstrations. This is an anonymous program- feel free to remove any labels or black them out with a marker. No questions will be asked. 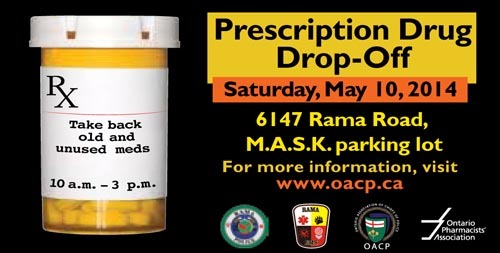 You can also drop off medications at any pharmacy on any day.